Summary Lower cost 2x2 AC1200 class PoE-powered cloud-managed access point. A client of mine is about to revamp their access point infrastructure, due to the need to get centrally-controlled and protected power to all access points. They've got a somewhat sprawling campus, typically only one Cat5e run per room, and a limited budget. So rather than try to run 30+ new Cat5e lines all over the place, they elected to change access point models to one with dual Ethernet ports, which will allow them to power all APs from a central PoE switch while daisy-chaining from the room AP to a room switch to feed all the wired Ethernet devices in each room. We initially selected the OpenMesh A40 APs [reviewed] for this project. But OpenMesh discontinued that model (and the 3x3 A60) in favor of the A42 (and A62), at a significant price bump. Since this is a 30-AP project, with a limited budget, I procured one of OpenMesh's much less expensive OM5P-AC access points, which also offers dual Ethernet ports, to test it for suitability. 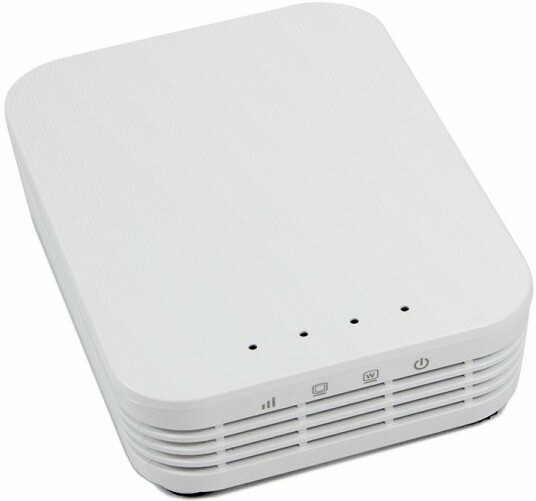 Like the A40, the OM5P-AC is an AC1200 class 2x2 access point. But don't let that big ol' product photo up above mislead you. It is tiny; about the size, shape, and weight of a pack of cigarettes (or cards). Unboxing it came as a big shock. I saw that it was a very unusual form factor when I ordered my test unit from Amazon, but hadn't actually looked at the dimensions. On the plus side, it's easier to cart a stack of them around, and they're relatively unobtrusive. On the minus side, anybody looking at one once they've spotted it is going to be thinking "wait, that's your access point? Really?" Fortunately, Open Mesh has thought about this and offers optional mounting enclosures. There's also a wall-plug enclosure not shown below. The key components in the OM5P-AC are basically the same as those in the now-discontinued A40. A Qualcomm QCA9557 2x2 11abgn WiFi SoC serves as the main processor and 2.4 GHz radio and a QCA9882 11abgnac 2x2 radio SoC runs the 5 GHz side. The FCC photos are not clear enough to identify the power amps or front ends used in either design. But the photos below show the layouts and antenna designs are clearly different. The OM5P-AC's photo shows AR8033 and AR8035 gigabit Ethernet PHYs are behind the two Ethernet ports. Here's the A40 board for comparison. The key components for both Open Mesh APs are in the table below along with two other much less expensive AC1200 APs, TP-Link's EAP-225v3 and Ubiquiti's UAP-AC-Lite. The OM5P-AC supports Open Mesh's CloudTrax cloud-based management system. See the A40/A60 review for an overview. Setting up the OM5P-AC is no different than setting up any other OpenMesh AP; you plug it into some PoE, log into your CloudTrax account, and adopt it from there. The feature summary below covers some of the key features. Download the OM Series datasheet for more info. I used the same process described in 2x2 AC Access Point Roundup - Part 2 to test the OM5P-AC. The suite consists of a simple multi-location HTTP throughput test and more interesting (IMO) multi-client latency tests. I find the latency tests to be a better indicator of how Wi-Fi routers and APs hold up under load. Once my new AP finally declared itself all-the-way ready, I broke out my four test laptops and had at it. We'll look at latency on the 2.4 GHz band first. Yeah, this is bad. One look at the 2.4 GHz curves, and I knew my client was going to need to pony up for the more expensive A42 access points. This little device performed about like it looked - severely underweight. Of course, the 5 GHz performance certainly could be better. But the plot below shows the OM5P-AC still looking pretty bad on 5 GHz, though not as bad as on 2.4 GHz. There's a big takeaway you should spot when looking at these curves. Look how far away station A, the long-distance bedroom with four interior walls in the way, is from the relatively tightly-grouped B, C, and D. This is a clear indication that we're having an extreme range issue here. Station A is just plain too far a haul for this access point. The single client throughput chart provides more insight into the OM5P-AC's range issues. Remember, Station A is our worst-case site with 19' four interior walls in between it and the access point. And Station D is our best-case, with only 10.5' and a hollow-core closet door in the way. In the single-client testing, we don't have any other stations to contend with. So when we see an abysmal 23.6 Mbps of traffic to Station D on 2.4 GHz here, this really is the death knell for the little OM5P-AC's 2.4 GHz performance. On the other hand, the AP does quite well on Station D at 5 GHz at close range. But its 5 GHz Station A performance reinforces our earlier take that Station A is probably just too far away for the OM5P-AC, and that on 5 GHz at least, it might actually be a decent little AP if you don't overwhelm it with long-range stations. This brings us to a new station you see here on the single-client throughput graph above, Station E. Station E (in the far corner of the kitchen, about ten feet to the right of Station B) is still a fairly long shot, at 42' from the access point. But unlike Station A, it has only a single interior wall in the way. Station E brings in a pretty solid 90.7 Mbps in single-client throughput testing, which means it's well within the OM5P-AC's effective range. So, what happens if we do another multi-client run on 5 GHz - but this time, we substitute a laptop at Station E for the one at Station A? Suddenly, we're looking at a whole different ballgame - our response curves are reasonably well grouped, with only a moderate gap between long-range station E and the other three. The reason I'm showing you this isn't so much to demonstrate anything about the OM5P-AC, though. It's more that this is a great opportunity to demonstrate the importance of site design, and of setting MinRSSI on your access points. The OM5P-AC, like most access points, is configured from the factory to be willing to talk to any STA that can successfully associate with it, even those that have much too poor a signal to do a good job of it. The resulting slow-as-molasses "conversations" between that station and the AP hurt performance on all associated stations, not just the long-range one. When our longest-range station is the much-more-reasonable Station E instead of Station A, the OM5P-AC's 5 GHz performance skyrockets from "horrible" to "perfectly reasonable" in the blink of an eye. If we were really designing a multiple-access-point network, the takeaway here is that we should make sure both to have enough APs so that no station is ever making a connection as poor as the one from Station A to this access point was. A reasonable MinRSSI value should also be set to prevent any particularly stubborn or stupid clients from attempting to make such a connection anyway, whether or not there's a closer AP for them to associate with. Despite demonstrating how to get the most out of it here, I still would not recommend the OM5P-AC for most sites and most administrators. Nothing's going to fix its poor 2.4 GHz performance, and its lower 5 GHz range will require much more careful babysitting and tuning to keep the WLAN stable and performing well, even with an experienced operator at the helm. Since my client has tons of 2.4 GHz only single-band devices, the OM5P-AC was going to be a no-go. ...and 5 GHz latency. 'Nuff said. I only purchased a single OM5P-AC to evaluate it for my client's project, so no roaming tests were performed. I would generally expect it to handle roaming similarly to the OpenMesh A60 tested in the roundup.